As I mentioned last week, Canada's new Food Guide is a giant step forward. But having read through all the published materials to date, and putting aside things that are beyond the ability of a food guide to address (like food insecurity for instance), I do believe there's one very large missed guidance opportunity - nutrition, kids and sports. As it stands, I couldn't find anything. And that's a shame because there's a huge amount of misinformation out there about kids "refuelling", "recovering", or "rehydrating". There's also a massive industry built to prey on kids and their parents telling them that they need electrolyte enhanced sugar water, or chocolate milk every time they move for a few minutes. There are community races that teach kids running a 5km fun run that they need a banana, bagel, juice, and a protein bar for their 40 minute trot. There are league run programs like Tim Hortons' "I just played I'm thirsty" to bring kids and their parents in and cultivate brand loyalty. There are partnerships between dairy producers and the NFL designed to promote chocoloate milk, and I guess determined not to be left out, Nesquik partnered with the American Youth Soccer Organization to sell chocolate syrup. And as any parent today knows, snack time for pretty much any organized sport is a sport-washed junk parade. Consequently, I would have loved to see a section of Canada's Food Guide's guidance devoted to kids and sports. A section that explained that if it's less than an hour, probably the only thing the kids need is water - and even then, only if they're thirsty. 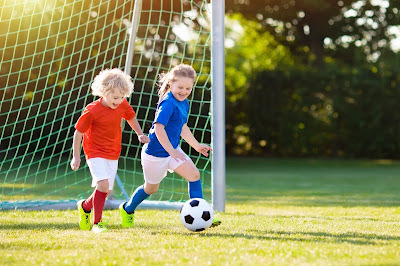 And that there are no sugary beverages that kids can quaff that will appreciably improve their performance, or help them to recover, and that when it comes to organized sport, leagues and coaches should be encouraged to affect changes to see sidelines and post game snacking relegated to the water and fruit slices of yesteryear. Though that guidance alone would not lead to immediate change, having it be part of Canada's Food Guide would support public health advocates and parental champions in their efforts to affect change, and over time, slowly seep into the public consciousness. As to how to fix it? Well here's the thing. In 2019 the new Food Guide need not be a static set of documents. Living online the guide can expand, contract, and change on an evidence-based and as needed basis. Which means there's nothing stopping Health Canada from spending the tiny bit of time required to suss out this topic and publish it alongside already available guidance. Here's hoping we see it soon.